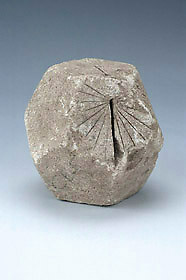 Polyhedral dials were popular from the 16th century onwards but examples in stone are often difficult to date. It is possible that this weathered and damaged stone dodecahedron could be 16th-century, but it might equally date from 200 years later. Three of its pentagonal faces have hour lines and slots in which (missing) gnomons would have been inserted.